Synopsis : Warnings and alerts for earthquakes, hurricanes, tornadoes and natural disaster advisories for seniors and people with disability. 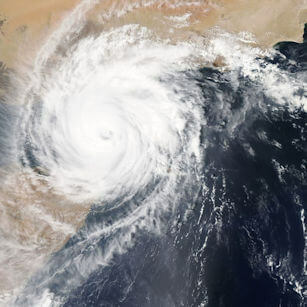 With seemingly increasing frequency of natural disasters occurring around the world today Disabled World has added an advisory section for seniors, persons with disabilities, and the mobility impaired. A natural disaster is the effect of a natural hazard (e.g., flood, tornado, hurricane, volcanic eruption, earthquake, or landslide) that affects the environment, and leads to financial, environmental and/or human losses. The resulting loss depends on the capacity of the population to support or resist the disaster, and their resilience. For people with disabilities, barrier free, as well as, barrier-ridden environments become a great deal more hostile and difficult to deal with during and after an emergency. People need to plan for emergency evacuation in anticipated and unanticipated situations including chemical, biological, radiological, explosion, transportation accidents, fire, floods, earthquakes, mud slides, hurricanes, tornadoes, snow storms power outages, etc. Overhead satellite view of a hurricane (Cyclone) approaching landfall. A Hazardous Weather Outlook is issued daily to indicate that a hazardous weather or hydrologic event may occur in the next several days. An advisory is issued when a hazardous weather or hydrologic event is occurring, imminent, or likely. Advisories are for "less serious" conditions than warnings. An Emergency is issued when an event that by itself cannot pose a threat to life or property, but may indirectly cause other events to happen that may pose a threat to life or property. A watch is used when the risk of a hazardous weather or hydrologic event has increased significantly, but its occurrence, location, or timing is still uncertain. A warning is issued when a hazardous weather or hydrologic event is occurring, imminent, or likely. A warning means weather conditions pose a threat to life or property. A statement is either issued as a follow-up message to a warning, watch, or emergency, that may update, extend, or cancel the message it is following up or a notification of significant weather for which no type of advisory, watch, or warning exists. Also See: Disaster and Emergency Planning for Seniors and Persons with Disabilities for emergency planning lists and further information. Interior Car Temperature Can Become Life-threatening for Children in an Hour - An average of 37 children in the US die each year due to complications of hyperthermia after being trapped in overheated, parked cars. FDA, FTC Warn Companies for Selling Illegal, Unapproved Opioid Cessation Products Using Deceptive Claims - FDA and FTC take action against companies illegally marketing unapproved products with claims to help with opioid addiction and withdrawal. Yemen Cholera Outbreak Is The World's Worst - Statement from UNICEF Executive Director Anthony Lake and WHO Director-General Margaret Chan on the cholera outbreak in Yemen as suspected cases exceed 200,000. Some Hip Implants May be Toxic to the Brain - Recent research reveals brain injury from highly toxic metal cobalt alloy leeched from failing artificial joints causing brain toxicity can be detected and measured. Citation: Disabled World. (2018/10/02). Natural Disasters Warnings: Alerts for Seniors and Disabled. Retrieved 2019-04-20, from https://www.disabled-world.com/disability/emergency/advisories/ Direct Link: Natural Disasters Warnings: Alerts for Seniors and Disabled - Warnings and alerts for earthquakes, hurricanes, tornadoes and natural disaster advisories for seniors and people with disability.